Welcome to the Schmucker Middle School Library. Below, you will find links to information about services offered in the Schmucker Library. Students at Schmucker visit the library every week with most Language Arts classes. This is the student's opportunity to choose books and other materials they will need for their classes. 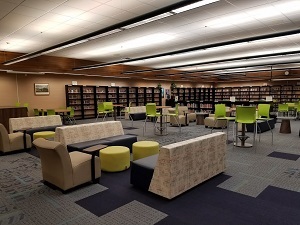 Students may also come to the library on a pass as their classroom teacher allows. The Library is also open before school from 8:50am - 9:00am. Students may check out up to 4 books. Books are due every 4 weeks. Books may be renewed if a longer time is necessary. Students who have anything overdue, may not check out any additional materials until the overdue item(s) are taken care of. If a book is lost, the student will need to pay the replacement cost for that book. If the book is found, after being paid for, the student will get their money back. Overdue notices are sent to students through email. Readers' Guide Full-Text Select: CLICK HERE. (Log-in: BAI44 Password: schmucker) This online database, by WilsonWeb, supplies links to hundreds of periodical articles. These full-text articles may then be printed. Inspire: Another online database that is supplied free to residents of the State of Indiana. CLICK HERE to link to this database. Full-text articles from periodicals, journals, and books are also available. When accessing Inspire from home, you may have to apply for a password to prove you live in Indiana. World Book online is now available at school and at home. You can access this site by clicking on the following URL: http://www.worldbookonline.com/?subacct=C8833. The log-in is schmucker, and the password is spartans. Other Databases: To access a list of several other databases, CLICK HERE. (You must have an active Mishawaka-Penn-Harris Library Card to access these databases). ​eBooks at Schmucker are available through the Online Catalog. The Online Catalog can be accessed by going onto the Schmucker home page, choosing “students” from the drop down menu, clicking on “Access SMS Alexandria” in the middle of the page, and then clicking on the magnifying glass labeled Search. When an ebook is found in the catalog, the student can click on the link to download the ebook.